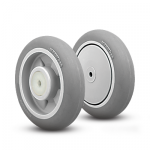 The most economical hard tread wheel solution, Polyolefin wheels are non-marking and resistant to frequent wash-downs, oil, grease, cleaning solutions, and most chemicals. 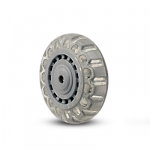 They have high-impact strength in a lightweight injection molded construction. These wheels have a temperature range of -20° to 180° F.
Soft rubber wheels combine a soft tread on a hard rubber core, offering quiet movement, a cushioned ride, and added floor protection. 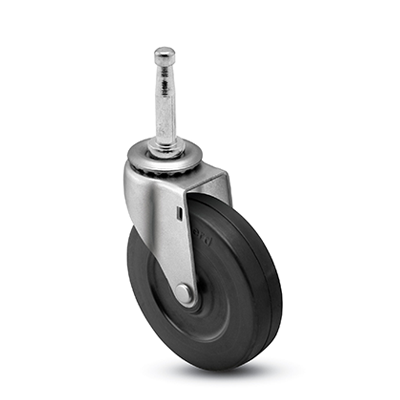 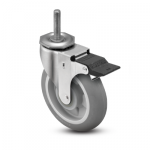 Hard rubber wheels provide higher load capacities and impact resistance. 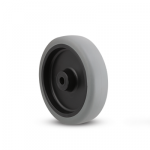 Both types are resistant to most chemical and oils, and have a temperature range of -40° to 160° F.
Thermoplastic Rubber (TPR) wheels are a better alternative to standard rubber wheels. 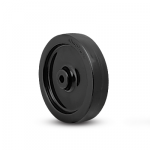 Non-marking, and floor-protective, the tread is chemically bonded to the core, and is resistant to chemicals and oils, and ideal for wash-down applications. 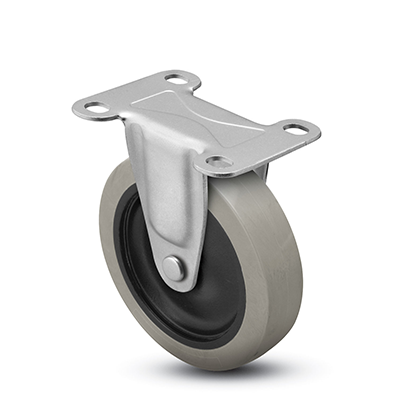 The temperature range is -40° to 180° F. TPR wheels can be manufactured in a variety of special colors; please consult the factory for minimums and details. Our Themroplastic Urethane (TPU) wheels consist of a high-grade urethane tread mechanically interlocked to a polyolefin core. The Urethane offers extended wear and excellent floor protection. Highly resistant to chemical and oils, the TPU wheels handle higher load ratings and provide excellent durability. 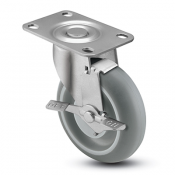 Their temperature range is -40° to 180° F.
No-Matic wheels have a pneumatic look and feel, without the maintenance and risk of flat tires. 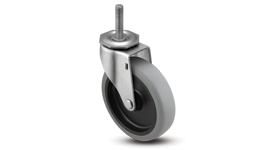 Capable of absorbing shock, these will roll over obstacles, thresholds, and uneven surfaces with ease. 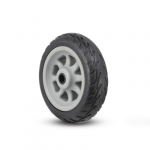 They are available in a non-marking grey tire. 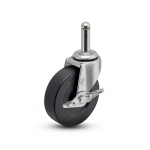 Vipor Wheels are made from a specialized material which provides excellent abrasion resistance with a very high-tech look. 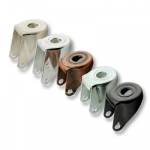 They are resistant to chemicals and oils. 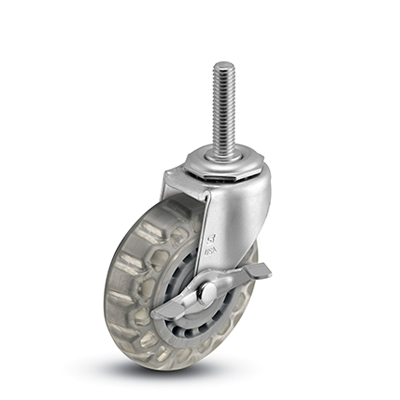 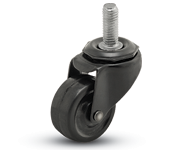 MonoTech wheels provide ultimate floor protection, and a quiet, cushioned ride. They roll over obstacles with ease and will not flat spot. 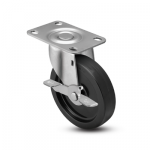 Excellent on any floor type, MonoTech wheels reject floor debris, including metal shavings and glass. 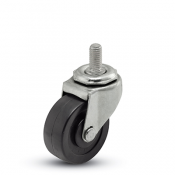 Donut tread wheels provide easier rollability and maneuverability. 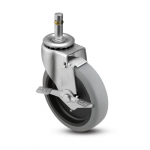 Their temperature range is -45° to 180° F.
The MonoTech wheel is also available in a Precision Bearing model (right wheel). 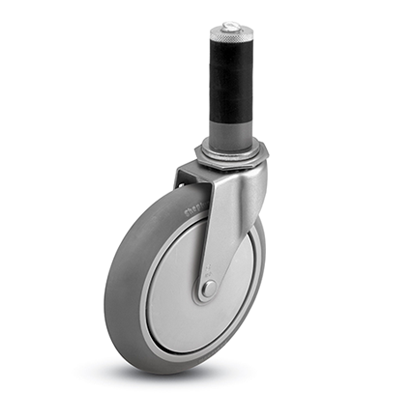 Finishes are pictured to the left. They are (from left to right): Polished Nickel, Bright Chrome, Copper Oxide, Zinc (Regent Standard), and Black Oxide.